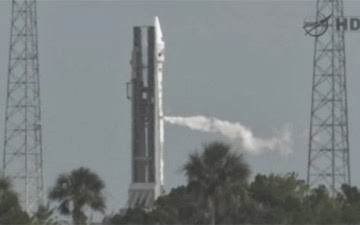 CAPE CANAVERAL, Florida -- With less than 20 minutes until liftoff, NASA is continuing the countdown for the launch of its MAVEN spacecraft aboard a United Launch Alliance Atlas V rocket today at 1:28 p.m. EST from Space Launch Complex 41 at Cape Canaveral Air Force Station in Florida. There is a 2-hour launch window for the Mars-bound spacecraft. As of November 17, the U.S. Air Force 45th Weather Squadron forecasts an 60% chance of favorable weather conditions on launch day. The primary weather concerns for launch day are cumulus clouds, disturbed weather, and thick clouds. MAVEN, which stands for Mars Atmosphere and Volatile Evolution, is on a mission to answer one of the Red Planet's greatest conundrums: If our arid celestial neighbor once had a thicker atmosphere and a surface flowing with water, as evidence suggests, how did the climate change so dramatically? Since 1964, NASA has flown a series of orbiters, landers and rovers to Mars, searching for chemical traces of water or signs that the planet once could harbor life. MAVEN stands apart from these because it's the first to focus exclusively on the upper reaches of the planet's atmosphere. The spacecraft will arrive at the Red Planet on Sept. 22, 2014, and slip into an elliptical orbit ranging from a low of 93 miles above the surface to a high of 3,728 miles. It also will take five "deep dips" during the course of the mission, flying as low as 77 miles in altitude and providing a cross-section of the top of the atmosphere. This NASA animation shows how the surface of Mars might have appeared during its evolution over millions of years from Earthlike blue skies and lakes to the dry terrain reddish hues seen on Mars today.